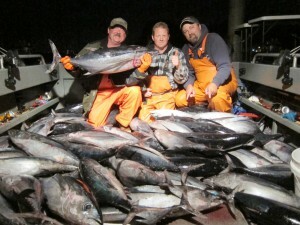 Washington has some of the best albacore fishing anywhere! These hard fighting fish can be very aggressive and are a blast to catch on live bait! This is a extremely exciting trip where it is very common to come in with our fish boxes full, we have been averaging 40 tuna per day over the last 2 seasons. This is a very fun fishery! It is not unusual for everyone on the boat to have a fish on at the same time when the bite is hot. We use electric reels! No more arm cramps while trying to pull in a monster from 600 feet. You can just lay the rod on the side of the boat and let the reel and boat do most of the work for you! 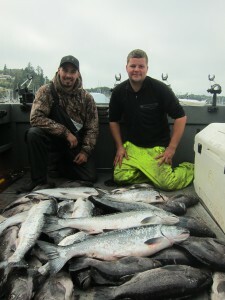 I do not know of any other charters that have electric reels for all their clients. 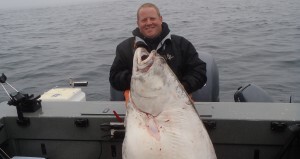 If you are looking to take home a huge saltwater fish this is the trip you want. On most days you will catch several halibut and our keepers will be in the 25 to 70 pound range with fish over 100 pounds possible. 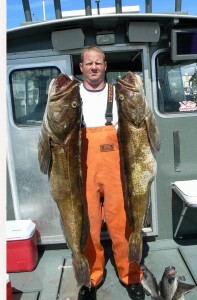 If you want to catch a huge lingcod off the Washington coast you have found the right guy! They call me lingcod Todd and there is a reason. I love catching big aggressive lings! We use electric reels on all our deep water lingcod and bottom fish trips to maximize our time on the water. The best areas are only open from march till may so do not wait till summer if you want to catch huge lings. 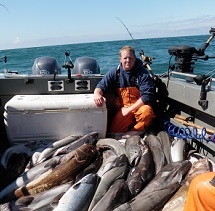 The Washington coast has great salmon fishing and when you are in the right spot it is not uncommon to have multiple salmon on at the same time! The biggest key to fishing the offshore salmon areas is being in the right spot. If you can be flexible so can I and it will pay off in a big way, if you want to be where the best salmon fishing is just book a date not location If we wait till just before our trip I can make sure we are fishing out of the right port for the date we will be fishing. I am in contact with people out of Neah Bay, La Push, Westport and Ilwaco almost daily. Washington has great near shore bottom fishing opportunities out of all its coastal ports from March till October (although still open for bottom fishing from November to March the ocean waters are normally too rough to fish) Many of our largest bottom fish: halibut, lingcod, sable fish are caught in the deeper waters further off the coast. The deep water rules differ for each port and can be a bit complicated. If you are interested in fishing for bottom fish please contact us, we would be happy the explain all the bottom fishing opportunities out of all the costal ports. Neah bay, la push, westport, and ilwaco.